24 ARTISTS IN ONE BOOK! 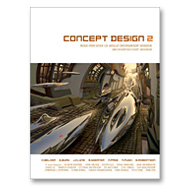 In this second volume of Concept Design, seventeen guest artists are featured along with the original seven Los Angeles Entertainment Designers from Concept Design 1 to show us worlds, vehicles, monsters and creations beyond the wildest imagination! Even more astounding and jam-packed than the first volume, Concept Design 2 takes you on a journey into the minds of the talented and successful concept design professionals who create for the sake of creation. Categories: Books, we made too much on the reprint. Tags: harald belker, neville page, nick pugh, scott robertson.